Young and the Restless spoilers show Rey Rosales (Jordi Vilasuso) tells Sharon Newman (Sharon Case) that Mia Rosales (Noemi Gonzalez) assaulted Lola Rosales (Sasha Calle). He begs Sharon to not spill this confession, though she could. Sharon might not want to keep this very serious secret to herself. Plus, given how he reacted when she shared her criminal secret, Rey’s being a bit hypocritical on Y&R on CBS. At the moment, only a few people know the truth about Lola’s attack. However, all that is about to change say Y&R spoilers. Of course, once more people learn the truth, the greater the chance this story will come out. So, Rey Rosales tells Sharon Newman the whole truth about his little sister’s attack. As he and Sharon are together now, it appears that Rey doesn’t want to keep any secrets from her. After all, she was angry when she learned about Mia’s pregnancy, something Rey didn’t tell her. 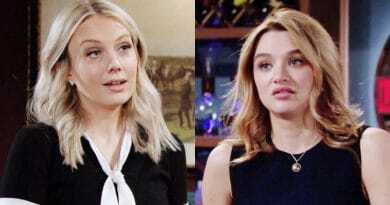 Young and the Restless spoilers reveal that Rey tells her Mia assaulted Lola thinking she was Abby Newman (Melissa Ordway). Then, he tells Sharon he refused to arrest his wife because Mia is pregnant. After, he makes Sharon promise to keep this secret. However, that might not be so easy. Rey & Lola discussed Sharon a little bit. "it sounds like you really care about her." Obviously, Mia Rosales is scared of arrest at any moment. Young and the Restless spoilers show Paul Williams (Doug Davidson) assigned Rey Rosales the assault. So, Mia worries. But Rey lied and told Paul that she had an alibi. He told his boss that Arturo Rosales (Jason Canela) was with her that night. While this gives Mia an alibi, it complicates things even more. Now, Paul wants to talk to Arturo, who could potentially ruin everything. After all, Rey hasn’t been able to get ahold of his brother to tell him about the fabrication. So, Y&R spoilers tease Arturo could refuse to go along with Rey’s lie. After all, he dislikes Mia right now since she cost him his engagement to Abby. No doubt, Mia will be doubly scared to find her nemesis Sharon Newman knows the truth. Young and the Restless: Will Sharon Keep Secret or Out Rey’s Wife? Y&R spoilers predict Sharon Newman must decide whether to keep Rey Rosales’ secret. However, this might be easier said than done. Especially since Mia keeps stirring up trouble and saying mean things to Sharon. While Sharon decided to stick with Rey after Mia’s pregnancy reveal on Young and the Restless, this latest twist might change things. It’ll surely change their relationship. She might not be willing to keep this secret, especially from Lola. This could be part of Mia’s exit story. Plus, if Sharon spills, that would get her enemy out of the picture. As Sharon Newman competes for Rey Rosales’ undivided attention, she may have a hand in spilling this secret and making sure Mia is gone once and for all from the CBS sudser. Make sure to head back to Soap Dirt daily for these and more Young and the Restless spoilers. ‘Young and the Restless’ Spoilers: Lola Has A Special Christmas Gift For Kyle?